Changshu Tongrun Auto Accessory Co., Ltd is rated as “High-Tech Enterprises” in Jiangsu Province. The company has 2 China well-known trademarks. The products are considered to be some of China’s most famous branded products and listed as key new product plan in Jiangsu province. The company is rated as the intellectual property management standardization demonstration units in Jiangsu province. The aluminum jack is listed in the National Torch Program projects. Changshu Tongrun is the only one manufacturer who can provide the total solution of the hydraulic maintenance equipment and lifting device in China. 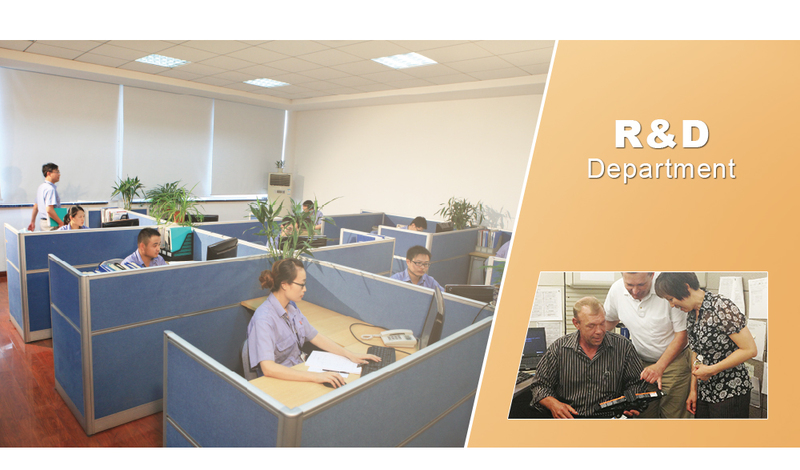 Since the company was set up, Tongrun always emphasizes our R/D, and invests no less than 5%of the sales into R/D. Adhering to the concept “Everything comes from innovation”, Tongrun keeps on adjusting and upgrading our company structure, focusing on the future products, producing the high value-added products which has independent intellectual property. 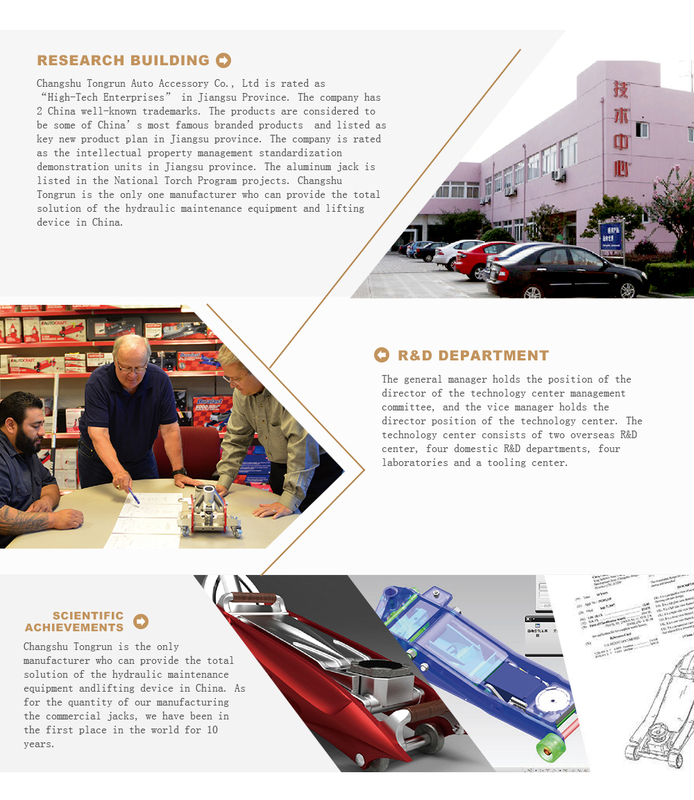 Technology Center was founded in 2009, including the research and development, technological upgrading, technology, quality assurance, test center, measuring department, tooling center, etc. This center has 260 professional and technical personnel. With the software such as UG, CATIA and the analysis calculation software , the design cycle and trial production process are greatly shortened, as a result the improved efficiency. Technology Center carries out several projects such as “Research of new material in the hydraulic oil and metal”, “Research and development of the quick lifting device”, “Research of automatic speed adjustment when low down the load”, “Stroke adjustment technology development”. With the optimization of the structure and the lightweight design combined with the finite element analysis, improving the material utilization ratio, reducing the material consumption and saving the resources. Technology Center cooperates with Ford research center, GM research center, Nanjing University of Technology, Yangzhou University, Changshu Institute of Technology, Northwest Rubber and Plastic Design and Research Institute, to establish sustainable development projects, realizing the global research and development and data sharing. Tongrun was responsible for the drafting of the standards “GB/T27697-2011 Hydraulic bottle jack”,“JB/T 2104-2002 Hydraulic Jack”, “JB/T5315-2008 Hydraulic Garage Jack” and “JB/T2592-2008 Screw Jack”. as a leader in the industry. Changshu Tongrun is rated as “High-tech enterprises” in Jiangsu Province, and has several “High-tech products in Jiangsu province”, “National Torch Program Product”. As of the end of June 2016, Tongrun has more than 180 existing patents, including over 10 overseas patents and 40 invention patents, covering all aspects of the hydraulic equipment. Among them, a number of invention patents maintain the global leader in technology. Technology Center keeps on using the new research technologies and new process in the production development and production. Various advanced research and development means provide the favorable condition for technology innovation activities. Technology, YangZhou University, Changshu Institute of Technology, Northwest Rubber and Plastic Design and Research Institute. Research and application of the intelligent digital cylinder, improve customer service and the quality brought to market. Research and development of hydraulic equipment for forestry, support the forestry resources development. Research and development of emergency hydraulic tools, equipment, support the emergency rescue and disaster relief. Research and development of special marine hydraulic equipment, support the development of marine resources. In the next 5 years, to complete about 30 new products , to complete 150 patents . Company will be responsible for drafting of two national standards, industry standards. a prodcer since 1968, largest commercial jack factory, high production capacity. sales company in USA, and large logistical center ,24h after sales service in USA Changshu Tongrun Auto Accessory Co., Ltd., specializing in the research, development and manufacturing of various hydraulic jacks, is a jack export base designated by the Chinese government. Our firm has more than 40 years of history and products are sold to more than 140 countries. Now we concentrate on car accessories and professional lifting equipment, such as car lifts, shop presses, transmission jacks, and garage jacks. Our factory is certified by ISO9001, ISO/TS16949, and ISO14001 systems, and most of our products have acquired CE certificate. We take customers' demands as the basic point.